YAKIMA, WA - Both Davis High School students and Eisenhower High School students competed in the Washington State Technology Student Association Conference in March. 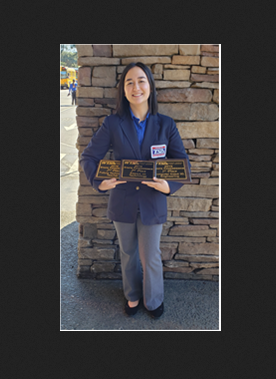 Koto Durkee won 1st place in the CAD 3D, Engineering category, 2nd place in the Future Technology Teacher category, and 2nd place in the Essays on Technology category. 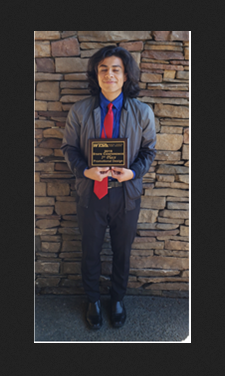 Daniel Montes won 1st place in Promotional Design and 8th place in Dragster Design. Jordyn Wearin and Isabellarose Lutgen won 3rd place in Computer Integrated Manufacturing. Cristian Berber, Eva Bush, Daniel Gonzalez, Leo Martinez, Kate Pizano, and Elian Silva won 5th place in the On Demand Video category. Denilson Antonio Ruiz, Alejandro Delgado Bustos, Brian Garibay-Sanchez, and Jose Rico Gonzalez won 5th place in the Robotics Challenge. Kaylie Baker won 6th place in the CAD 2D, Architecture category. Daniel Gonzalez, Leo Martinez, and Kate Pizano tied for 8th place in the Digital Video Production category. Cristian Berber, Eva Bush, Anayeli Hermoso, and Elian Silva tied for 8th place in the Digital Video Production category. Jordyn Wearin won 9th place in the Extemporaneous Speech category. Isabellarose Lutgen and Wendy Oceguera won 9th place in Fashion Design. Patrick Bushman won 1st place in Computer Aided Design. Bushman, as a first place winner is now invited to attend the National TSA Conference in Washington DC on June 27th – July 3rd. Andrew Boucher won 3rd place in Computer Aided Design. Patrick Bushman and Andrew Boucher won 4th place in the Architectural Design Team Event. Hayden Nyberg won 4th place in the Computer Aided Design - 3D Engineering event. Jesus Barron-Barajas and Kyle Jang won 4th place in the Computer Integrated Manufacturing Team Event. Jacob Cochran and Hayden Nyberg won 7th place in the Computer Integrated Manufacturing Team Event. Jesus Barron-Barajas, Jacob Cochran, Kyle Jang, Hayden Nyberg, and Lee Vera won 9th place in the Board Game Design Team Event.